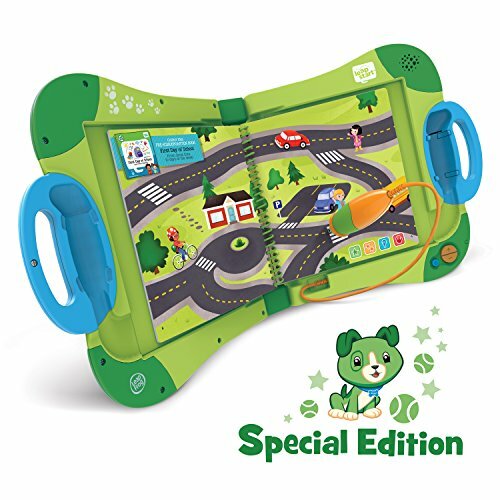 Get kids excited about counting, learning to read, problem solving and more through fun, replayable activities with this LeapStart interactive learning system featuring Scout. The magic behind LeapStart is a stylus that reads invisible dots on every page, triggering questions, challenges, songs, jokes and more. The stylus is comfortable for kids of all ages and promotes proper writing grip. The LeapStart library features touch-and-talk games, creative challenges, problem-solving puzzles, math mazes and more for 2-7 year olds with more than 30 activities in every book. Most replayable activities have two levels with more than 50 key skills per level so kids can play and learn at the right level and move up when they're ready. The LeapStart library of 25+ books (sold separately) covers a variety of preschool through first grade subjects and includes two learn to read book sets. A total of 400+ activities help kids build tomorrow’s skills today.